Sally Hansen sent me three of the polishes from the Under the Sea Collection to share with you. This collection has seven wonderful shades of blues and greens. These polishes do have amazing color and shine. They applied wonderfully and only two coats were needed to get the coverage I wanted. I love that they dry to a high gloss shine. The swatches below are two coats and no top coat. Let's move right to the swatches. Jungle Gem - is a very dark teal polish. The coverage and shine are amazing. I really love this shade. It has a richness to it that is gorgeous! Black and Blue - is a shimmery blue/green/black duochrome. The duochome was very hard to capture with the camera. This polish has a depth to it that seems to go on forever. I think this is my favorite of these polishes. Water Color - is a bright and cheery sky blue color. The brightness of this shade and the glossy finish make for a wonderful manicure. Sally Hansen Complete Salon Manicure polishes can be purchased in more food and drugstores for around $7. Spring nail art - It's a butterfly! Nail art is something I love to do. Sometimes it comes out and sometimes it doesn't. But I always enjoy creating it and trying to challenge myself. For this I started out with a base coat to smooth my nail and provide a nice "canvas" for the nail art. Then I used Zoya Purity on the tips. I didn't try to be super neat because I knew the flowers and butterfly would cover most of the edges. Then I used acrylic paint for the design. I have started using acrylic paint often for nail art. I can easily get it to a great consistency to work with and if it starts drying out I can add water to make it workable again. It is simple to mix colors together to get the colors I want. A margarine tub lid works great for a disposable palette. The brand of acrylic paint I use is Americana and it is readily available at hobby stores for around $1 per bottle. 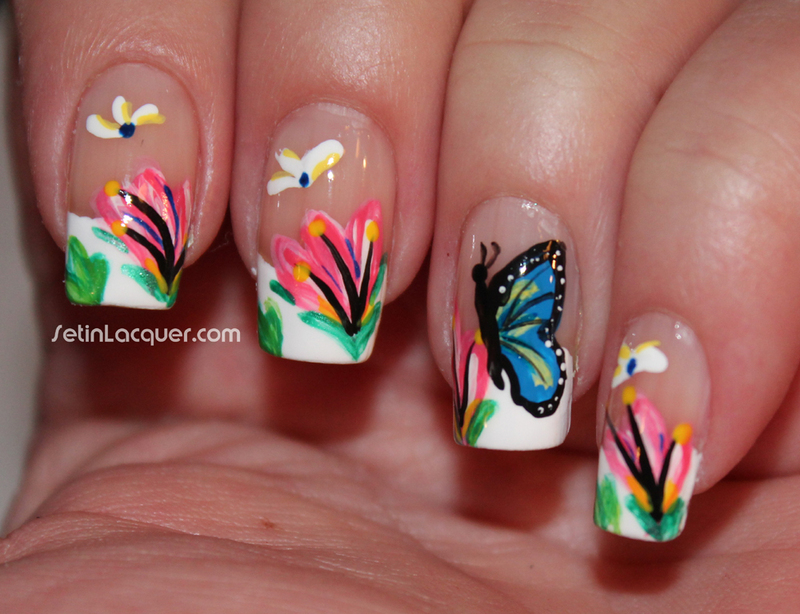 I used nail art brushes and painted on the flowers and butterfly. Not really hard to do if you just look at it as shapes. Rounded lines for the flowers, lines for the stamens and half a figure eight for the butterfly. Top it off with a glossy top coat and you have some unique nail art! 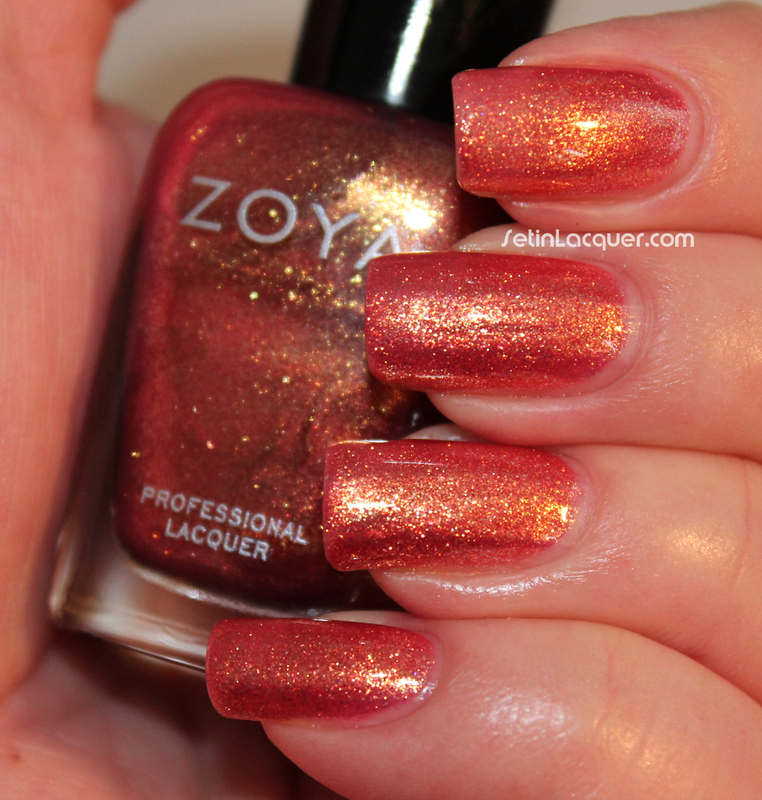 Zoya has been rather busy lately with new collections and I am mesmerized by them. I was lucky enough to receive the Irresistible Collection, which is a Summer 2013 collection, to review and share with you. These colors are amazing with tons of shimmer and shine. I love Zoya's glass fleck polishes and these didn't disappoint me. The flecks are evident without being over the top metallic. The formula was amazing as they applied flawlessly. The flecks rested flat against the nail and provided a multi-dimensional look. I didn't use a ridge filling base coat for these swatches and they level nicely. I almost always use a ridge filler even when I am swatching because I have such visible ridges. Let's move on to the swatches. No top coat was used in these swatches. Kerry - is a gorgeous gold polish. Perfect for a night on the town or a day on the beach. Amy - This is an awesome orange. I positively love this true orange shade. Look at that shimmer and shine! This is two coats. Tinsley - is a wonderful soft rose shade with a gold glow to it. This is three coats. Bobbi - is a fascinating fuchsia shade. This is my favorite of the the collection. It's bright, bold and shiny. Hazel - is a pale blue with a gray shimmer and shine. This is three coats. Rikki - is a soft green shade with a gold shimmer and shine. This is two coats. Zoya Polishes can be purchased at Zoya.com for $8. Make sure to check out their Earth Day promo for a wonderful deal right now. It ends soon so don't delay! 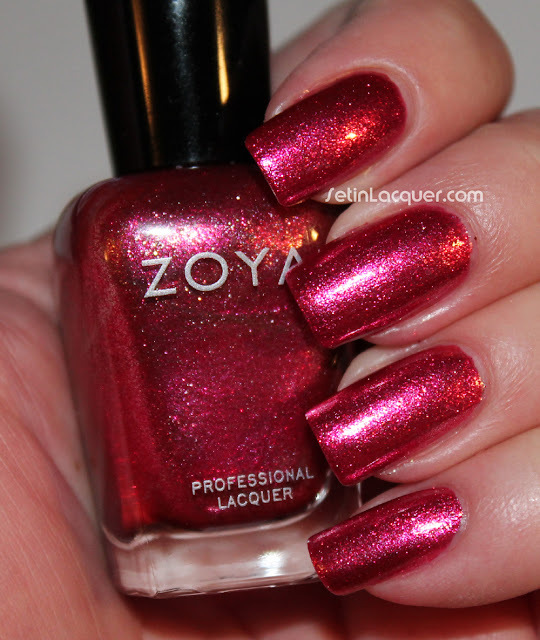 Zoya Stunning Collection is well... stunning! 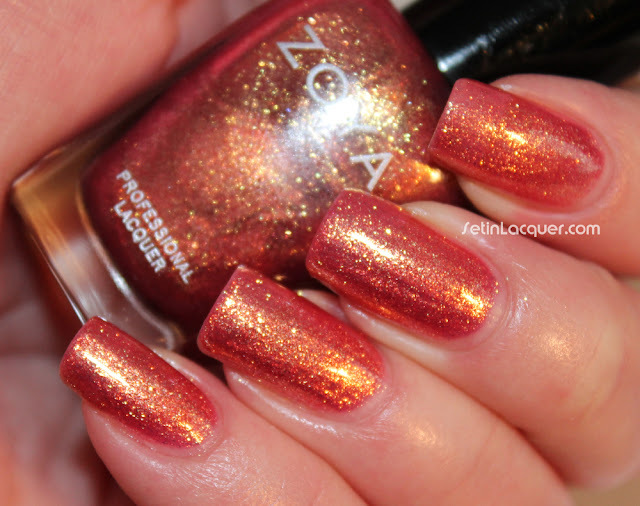 Zoya has released yet another collection - The Stunning Collection. I was lucky enough to receive it to review and share with you. The colors are bright and summery. Some of them weren't as bright as I thought they would be but they are gorgeous. 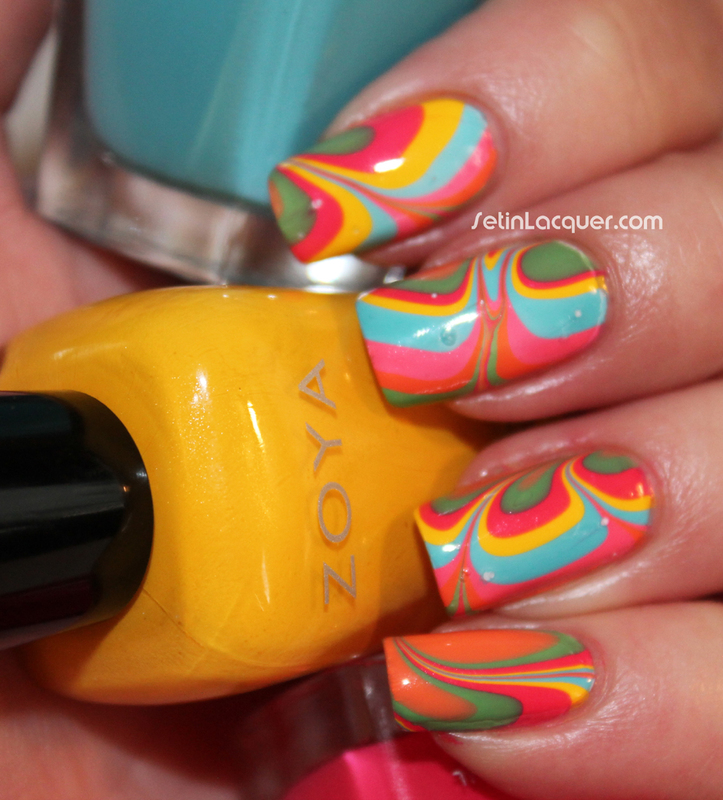 This is the Summer 2013 collection and after past Zoya Collections I was excited to try them out. These polishes are beautiful cream polishes that have the tiniest bit of shimmer. I did have slight formula issues on a couple of them. But nothing that would keep me from wearing them. Just be sure to give them a little extra time to dry between coats. Let's get right into the swatches. Thandie - is a phenomenal bright orange polish. I used three coats to get the coverage I wanted but I think if I had been careful I could have easily gotten by with two coats. I adore this shade. Micky - This is a soft pink with tones of coral in it. I did have to pay extra attention to this one when I applied it. The third coat did cover most of the streaks though. It is a gorgeous color though. Darcy - is a bright, sunny yellow. I love the brightness of the yellow. I think this is my favorite of the bunch. This took three coats for complete opacity. Yana - is a bright fuchsia pink. This one applied wonderfully for me and two coats provided the coverage I like. Rocky - is a a wonderful dusty blue shade. I love blues and this one didn't disappoint. It had a great application with no dragging or streaking. This is two coats. Josie - is a wonderful grassy green. It had a super application and two coats provided great opacity with two coats. Although I had to be care applying a couple of these polishes I still think they are a wonderful collection. I can't wait to try them in nail art. 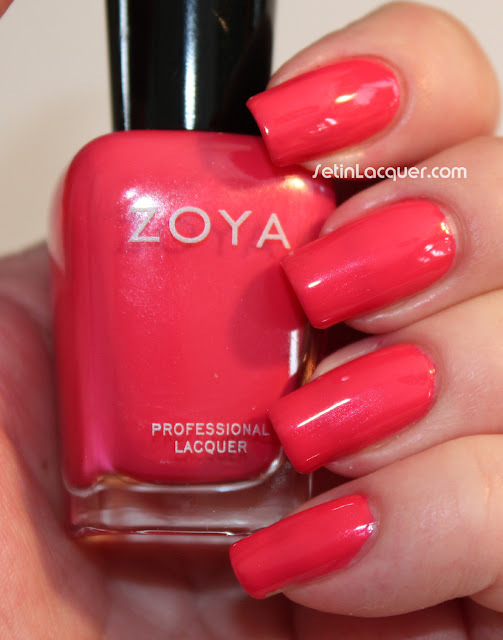 Zoya polishes can be purchased on Zoya.com. Make sure to check out their Earth Day promo this week! 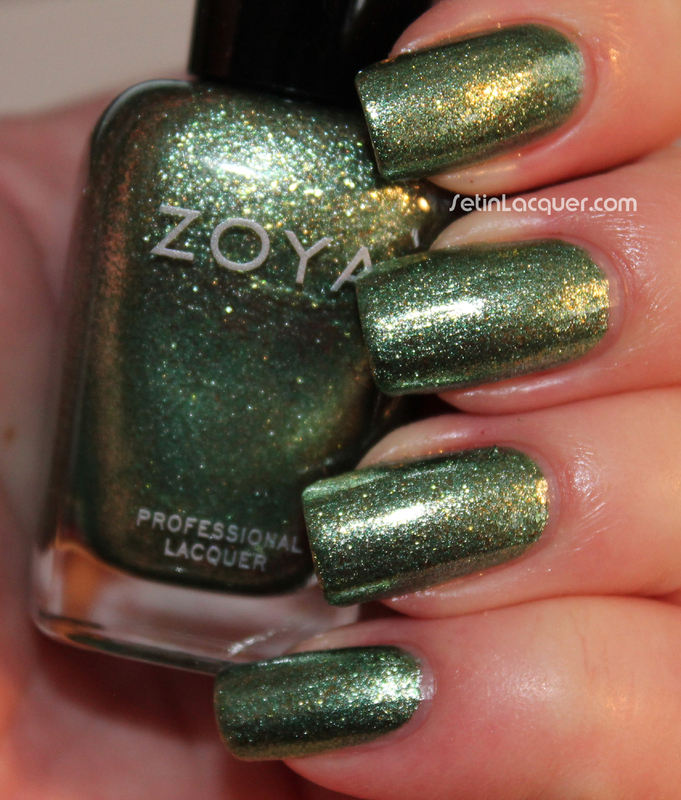 Zoya is churning the polish collections out - which is making me very happy. I received the Stunning Collection to share with you. The swatches will be in another post. 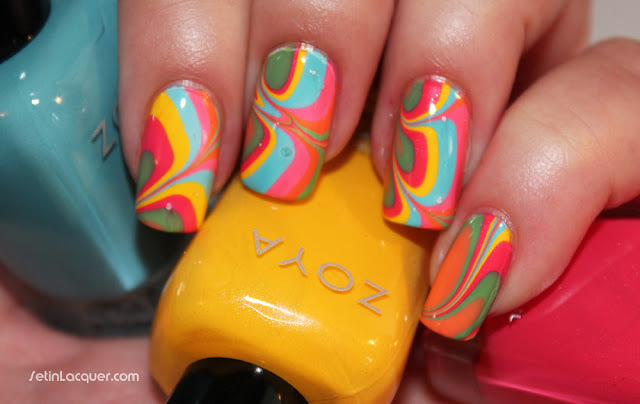 But I used all the colors in this festive summery water marble. I enjoy water marbling. It's fun and you never know exactly how it's going to come out. At least I never know. The Stunning Collection was great to marble with. It spread across the water wonderfully and the colors stayed vibrant. I used each of the six polishes in the "bulls eye" twice for the design. The colors work well together. The colors in this collection are Rocky (blue), Darcy (sunny yellow), Yana (fuchsia pink), Thandie (bright orange), Josie (grassy green), and Micky (coral pink). 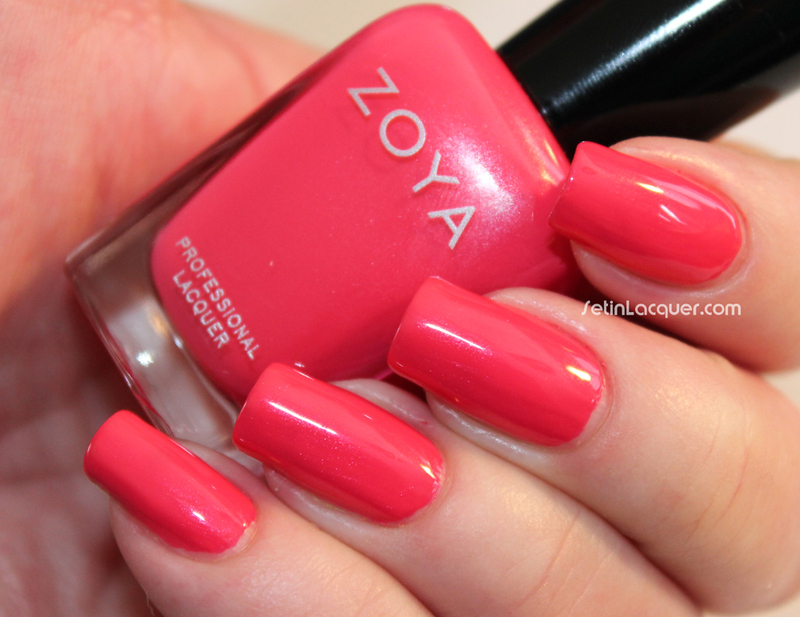 The polishes in the Zoya Stunning collection can be purchased at Zoya.com. What do you do when you get tip wear or just want to change the look? Just grab the scotch tape and apply some multi colored tips! I put on Barielle Pink Flip Flops from the Summer Brights Collection last night. I didn't have tip wear but I wanted something a little more bright for tomorrow and didn't want to start from scratch. 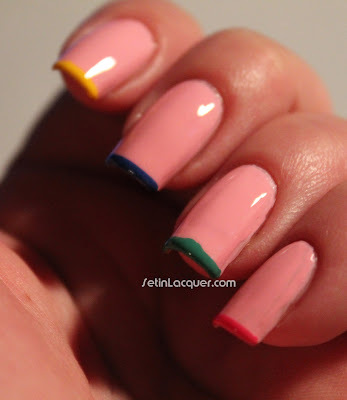 So I used the other four polishes in the Summer Brights to add bright summer tips to my mani! I am longing for Spring and Summer but it may be a while before we get to see those seasons. At this moment my car is stuck in a snow drift in my driveway. So these fun summery nails will have to get me through. I did smudge my ring finger when I pulled the tape off though. I tried to fix it but you can still see it. That's okay though. Odds are no one will get close enough to see! 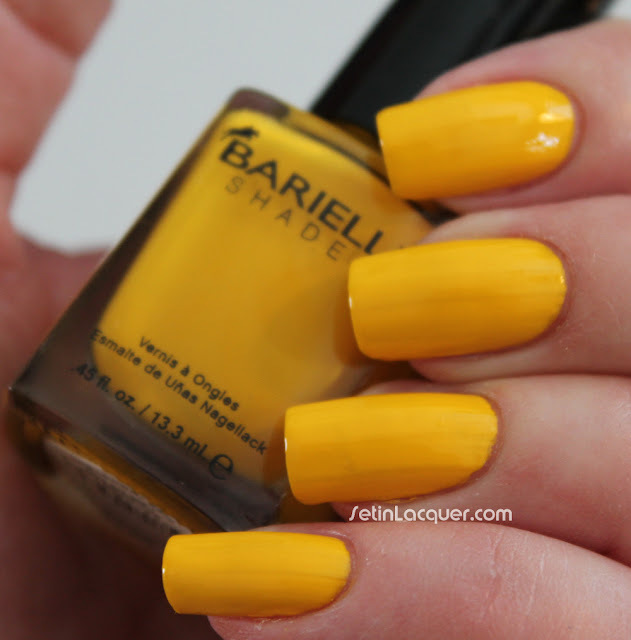 Barielle sent their Summer Brights Collection to for me to review and share with you. These shades are amazing. They have bright colors with rich pigments. Did you know Barielle products were originally formulated to condition the hooves of million-dollar thoroughbred racehorses? Just a little bit of trivia for you to remember when you watch those sleek animals run the Kentucky Derby. The five polishes in this collection bring to mind beaches, swimsuits, flip flops and summer fun. They applied wonderfully with the added bonus of a quick dry time. I didn't use a top coat for these swatches and look at that shine. These polishes are positively stunning. 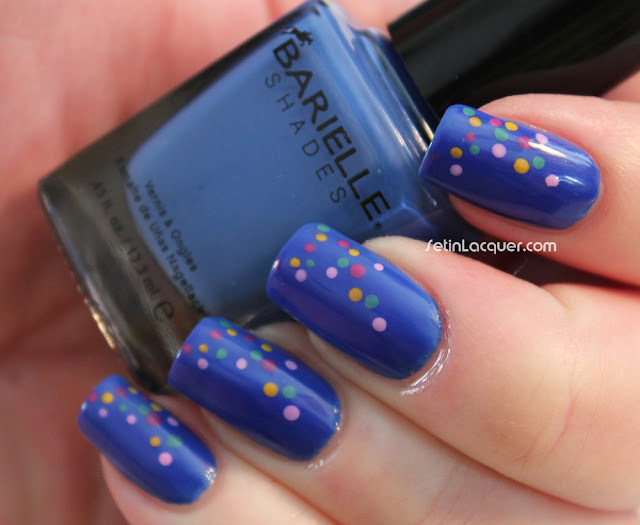 First up is a dotticure I created using Blue Capri as a base color and the other colors as the accent dots. Now lets move on to the swatches. Two coats provided wonderful opacity on these. Blue Capri - is a bright azure blue. This cream polish is bright and bold. Cosmic Kiss - is a gorgeous bright pink shade. I love the richness of the color. Lemondrop - is a fantastic bright and fun yellow. Yellow polishes often need several coats to provide opacity. This one only needed two coats. Pink Flip Flops - is the softest shade in the collection. A baby soft pink shade that whispers fun and girly. Sweet Addiction - is a cactus green shade. It is a rich cream polish. Barielle polishes can be purchased on their online store for $8. Follow them on their Facebook page to get news on the latest collections. I have two glittery bombshells for you today. Shimmer Polish sent me some of her amazing polishes with to share with you. Today I have Julia and Lucie. Shimmer Polishes are named after her the polish maker's friends and family. Each and every name has an important significance to her and is inspired by that person. 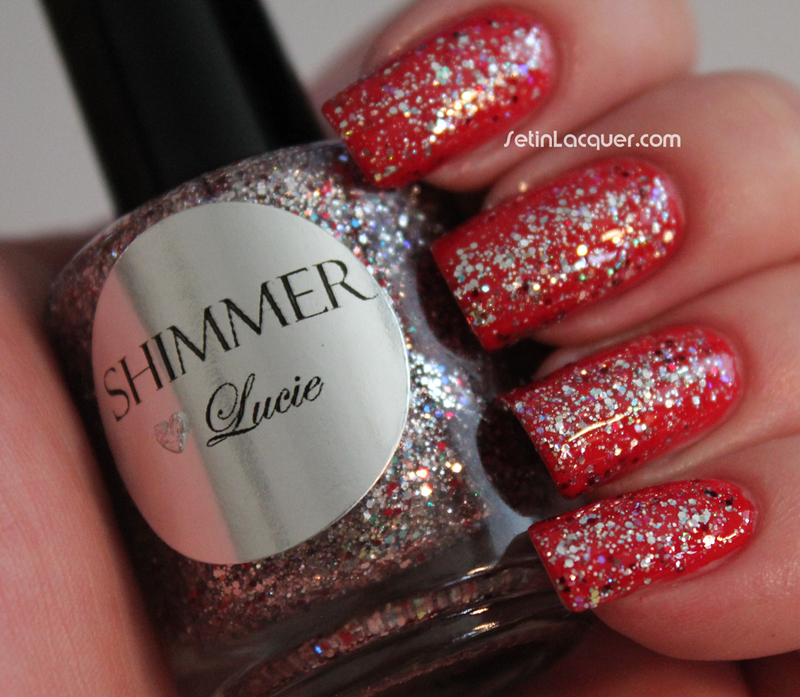 Lucie - is multi sized and shaped red and silver glitter. The application is wonderful. It goes on smooth and even. It is perfect for jazzing up any mani. Here I have one coat on over Sation Peppermint Pedi. Julie - is multi size, shape, and color glitter. The colors of the rainbow come alive in this bottle of glorious glitter. This is one coat over Butter London Scoundrel. These glitter polishes apply fabulously. You can purchase Shimmer Polishes on ShimmyShimmer.com for $12. Or you can purchase from her Etsy site. Make sure to follow her Facebook page to get updates on new releases and product information.